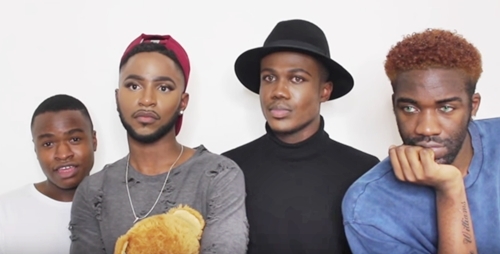 Tired of being stereotyped and not having their voices heard online, four friends turned to YouTube to share the experiences and struggles they face as black gay men living in London. Kevin Kwame, Damilola Adejonwo, Junior Joye, and Tochi Nwozuzu feel that their lives are not portrayed accurately in mainstream media, which, they say, relies on stereotypes of gay men, representing them only as“camp” and “feminine”. In recent months, hashtags such as #GayMediaSoWhite have been used to highlight the lack of black and minority ethnic LGBT people in the gay press. BuzzFeed News spoke to Adejonwo, Joye, and Nwozuzu. They said the other problem was a lack of prominent, black gay role models in British media altogether. Nwozuzu said the poor portrayal of gay men has affected his personal life: When he came out to his family, they struggled to believe him because they didn’t deem him a “stereotypical” gay person. “People think that when you come out, you’re being emasculated,” he said. Nwozuzu and his friends decided to take things into their own hands, and set up a YouTube channel. 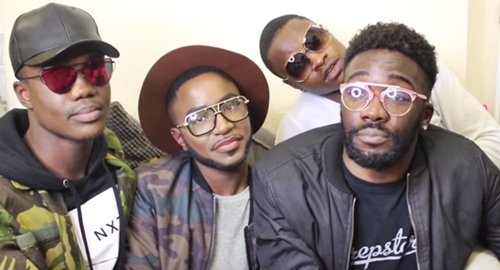 They shot their first video, titled “Gay Issues in London”, on 9 February this year; the video became so popular that they turned it into a series, including other videos such as “Coming Out – Gay Africans Telling Their Truth”and“Homophobia in London”, in which they discussed the negative experiences they face being black and gay in the capital. The video series gained thousands of views and made the four friends YouTube stars. They admit they didn’t expect their videos to go viral and be so positively received. “We get a lot of emails and comment from viewers that thank us for making our videos,” they said. Earlier this year, a man named Akinnifesi Olumide Olubunmi, was reportedly beaten to death in Nigeria by a mob for being gay. Olubunmi’s death hit a nerve with Nwozuzu, who made a video in response, called “Justice for All Nigerians”. Two of the friends in the group, Adejonwo and Nwozuzu, are Nigerian, and are critical of the laws in Nigeria that encourage homophobia. Though they want gay men in Nigeria to be happy with their sexuality, they warn them to “stay on the down low” (hide their sexuality) for the sake of their safety, and say that coming out in Nigeria may not be the “best thing to do”. 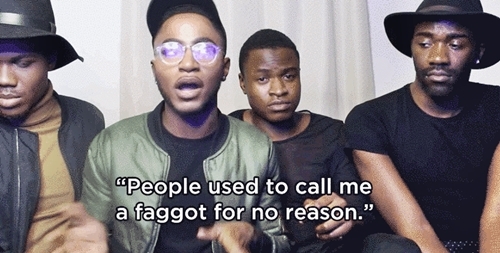 Adejonwo reflected on his own experience of coming out to his Nigerian family. “I knew the consequences,” he said, adding that he has had a “bad relationship” with them since he came out, but hopes it will gets better with time. He blames the reaction on what he called a common assumption among some African communities that homosexuality is a white, Western phenomenon. Nwozuzu said he also faced problems when he came out. He was threatened by a relative, he said, and many of his bad experiences “surprisingly came from my family”.